After making a lot of earnings with all of his self-composed songs, Big Bang’s G-Dragon didn’t keep it all to himself, but made sure to present his parents with something nice. Recently on online communities, pictures of a pension inn have been uploaded, saying that the inn belongs to G-Dragon’s parents as a gift from their son.The inn called ‘Dolce Vita, located in Pocheon, Gyeonggido, is known to have been a gift from G-Dragon and is stylishly designed just like the fashionista. 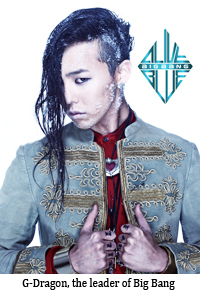 Each room inside is named after G-Dragon’s songs or other related keywords. Some of the names of these rooms include, ‘VIP,’ ‘Heaven,’ ‘Haru Haru,’ ‘This Love,’ ‘Crayon,’ and more.With the news of the G-Dragon inn spreading, the rooms have been filling up with Big Bang fans. It′s also said that G-Dragon′s puppies, Gaho and Jolie, can be spotted there from time to time. What’s the most awkward situation you have been in as a group? Big Bang Breaks Record For….? 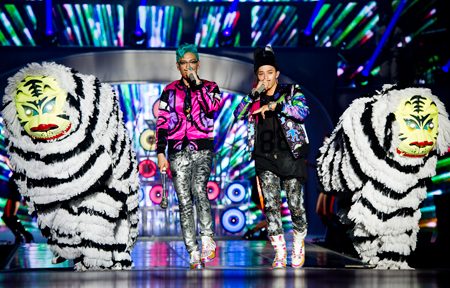 Big Bang has proven itself to be one of a kind once more through its recent concerts in Taiwan. The five members not only performed in two sold out concerts, ticket sales alone reportedly raked in 118.5 million Taiwan dollars in total (approximately 5 billion Korean won), making it the highest ticket sales for a Korean artist in Taiwan. Arriving in Taiwan on October 19, the group was quickly escorted through a specially-prepared separate gate, but even there, a swarm of fans and press outlets such as Taiwan’s NEXT TV and others were on hand to cover their arrival. After holding a press conference, the group kicked off its two-day concert the next day, where it performed smash hits Lie, Blue, Fantastic Baby and some 25 tracks in all in front of a passionate crowd. Among those in the audience were some of Taiwan’s biggest stars, including Vivian Hsu, Vanness Wu, Xinbo Fu, Lam JJ and more. It marked only the second time Big Bang has gone to Taiwan in their career with the group having paid their first visit this past April to commemorate Alive selling over 20,00 copies and achieving double platinum status. 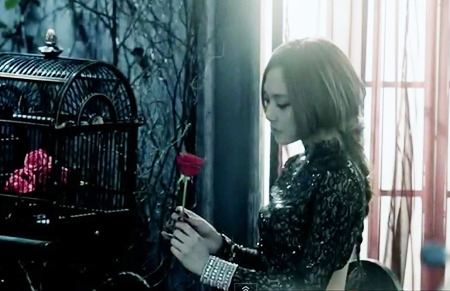 A promotional image for the album “Touch” shows Fei, memebr of multinational girl group Miss A. Currently, K-pop programs are filled with new faces such as Sunny Hill, or B.A.P., but that is about to change. Many groups are returning to the stage here in the coming weeks after wrapping up their schedule abroad or dedicating their time to new albums. Last year was a tough one for the K-pop group. In November, G-Dragon, the leader, had an indictment suspended by the Seoul Central District Prosecutors’ Office after being questioned on charges of smoking marijuana. Another member, Dae-sung, was investigated after he ran over a 30-year-old man lying on the road before crashing into a parked taxi on Yanghwa Bridge on May 31. The prosecution cleared Dae-sung of charges for causing the death due to a lack of evidence. Following the release of the mini album, the group will embark on a world tour “Big Bang Alive Tour 2012.” Starting with shows in Seoul Olympic Park from March 2 to 4, Big Bang will perform in 25 cities in 15 countries. 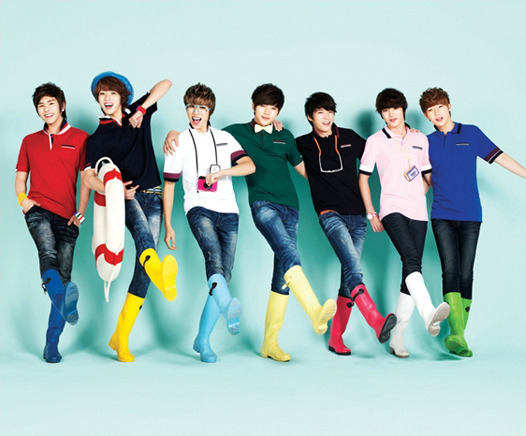 The group recently shot the music video for “Blue” and “Bad Boy” in New York. Miss A, a four-member girl group from JYP Entertainment, released its mini-album “Touch” on Monday. It includes six songs — “Touch,” “Lips,” “Rock ’n’ Rule,” “No Mercy” and “Over U.” The title track “Touch” is a catchy song about a heart break produced by Park Jin-young, the president of the agency. 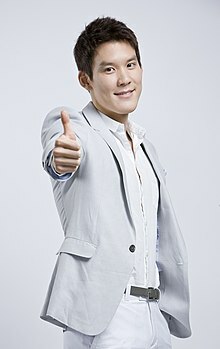 Upon release, it ranked number one in various music listings in the country such as Melon, Bugs, Mnet and Olleh Music. The music video is an experimental work that uses psychedelic images as well as frequent zooming techniques that accentuates the choreography. Incorporating sets and attire from the aesthetics of Shanghai in the 1980s, the footage manages to bring out mature beauty from the four young members. The video topped a Chinese music chart Yin Yue Tai on Monday. Miss A will be performing on channel Mnet’s “M Countdown” today. Rock-inspired K-pop group CNBLUE will be returning home in March after a successful year in Japan. Their second single in Japan “Where You Are” ranked number one on the Oricon Chart in January, as the first foreign artists since Canadian rock band Mashmakhan in 1971. On March 9, CNBLUE will perform in LA with F.T. Island, another K-pop group. This is not either of our views. I am not sure if my partner in crime has heard the album yet but I certainly have and I love it. I am in love with the song “Blue”. I am just posting this review for everyone to indulge in a discussion. Even before the concert, all five members of Big Bang reeked of fatigue. The press conference preceding the evening show Friday was meant to celebrate the 25-city 16-nation world tour they were about to embark on, but instead, G-Dragon, T.O.P., Taeyang, Daesung and Seungri were demure, even aloof. They sneezed and coughed sporadically. While he kept his word, others failed to match his level of energy or panache. 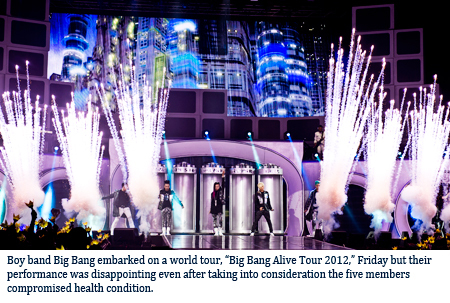 The first night of the “Big Bang Alive Tour 2012” was a mixed bag ― even after taking into consideration the members’ less than perfect health ― because it offered little new. The overall “upgrade” by celebrity creative director Laurieann Gibson of Lady Gaga fame added little excitement. Some of her influences actually worked to the show’s detriment. The backup band, provided by Live Nation, the world’s largest concert promoter/organizer, was the biggest plus; it is something hopefully other K-pop bands will emulate in the future. Working non-stop and achieving massive success in Korea and Japan since their debut at the end of 2006, Big Bang seems to be suffering from overexposure. Five years into their career, they have had four albums, seven EPs, four compilations ― and five tours on top of countless live-television performances. Some of the band members, therefore, seemed to go through the motions instead of adding some extra spice or improvising. They did not give their best, though none of the predominantly teenage female crowd seemed to mind. Nothing was out of sync, with the exception of Daesung’s off-pitch high-note in the beginning. Every fiber of their muscle tissues knows every move of each song by now. They breezed through the set of 20-something hits with few breaks. The members naturally looked most interested when they sang the tracks from their just-released “Alive” EP because this was their first time performing them. All of them were “great pop records,” as Gibson had said in the press conference, and the audience responded with the loudest cheers of the night. Taeyang was the only exception to the group members’ general disinterest. Gibson likened him to the late Michael Jackson, and in time, he may come close to proving that bold statement. Though the smallest in stature among the five, he had the most stage presence; even when he was not singing, all eyes were naturally drawn to him; there was always something happening. It was obvious how much he loved being on stage, giving his all, reveling in the well-deserved cheers the adoring crowd was showering him with. His Usher-like t-shirt ripping could be limited to just once for the evening, though. The Live Nation band was a welcome addition and provided great enhancements to songs like “Fantastic Baby,” “Bad Boy” and especially “Blue.” The Olympic Gymnastics Stadium’s usual horrifying acoustics notwithstanding, they proved why music should be experienced in a live concert. Sound engineers must be called out for their extraordinarily poor performance. T.O.P.’s rap was rarely intelligible because the volume was too low and the microphone too muddy, while Seungri’s weak vocals were noticeably compressed and pumped up. G-Dragon sang and rapped brilliantly live, but his voice was too processed for the audience to appreciate. In general, Gibson and her team took the fun out of a live concert by packaging Big Bang’s usually crowd-friendly and interactive show into a rather distant affair, having them churn out medleys of hits without much time to actually connect with the adoring fans. Much like a greatest-hits tour of a seasoned American pop artist, there were pyrotechnics and colorful lighting to set different moods as the show progressed. As great as they would look as a photograph, they did not add much to the experience. The nonsensical computer-generated images on the giant screens were of comic value. The whole night, the band members were conspicuously independent, never interacting with each other unless speaking to fans. Unlike other K-pop groups, they rarely had heavily-choreographed dance routines either. Therefore, to maintain that vibrant Big Bang character, of five individual members performing with their own character, they needed to be in optimal shape. Unfortunately on this particular night, they were not. And they did not deliver.